This post is part of a 31 day series – “31 days to decorate your home on a budget.” You can read through all the posts in this series here. And if you don’t want to miss a post you can subscribe by email, join me on facebook, or follow this blog in your reader. Thanks for reading along! It might be something green! Plants are a great way to decorate on a budget! And they are good for your families health too since they help clean the air of pollutants. The pictures above are all off designer websites (like Pottery Barn!) 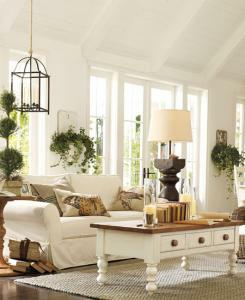 The next time you pick up a décor catalog, pay attention to the pictures – you will see plants in 80% of the pictures. And this is my newest plant! Kroger had their plants 50% off the other day, making this $4. It is my dining room. If you don’t have a green thumb, but still want to add some pops of green to your space, consider adding some faux foliage. I love these little green plants (from Ikea) and have several of them spread through my house in my favorite yard sale milk glass containers. So the next time you are at Wal-mart, Home Depot, or even the grocery store, check out the plant selection and pick one out to take home! 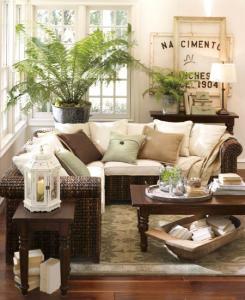 The air in your home will be cleaner, and your space with look great with a fresh pop of green! How about you, do you have plants in your home? What are your favorite types of houseplants? Do you have a green thumb? I SO do not have a green thumb though I HAVE tried!! That is very interesting though about plants cleaning the air. Maybe I should try, try again! I do love some faux foliage though! 🙂 Love that last pic with the pinecones in the vases! I need to do that one! Not only do I not have a green thumb- the big joke around my house is that I have a brown thumb! I do have 2 plants that (miracle of miracles are still alive!) I ‘ve had them both for around 9 years. One is an ivy (Iknow they’re hardy) that I got from my mom’s memorial service and the other is from when my son was a year old and had surgery. (He just turned 10). I do love plants though! Your series is very inspiring. As a mom who quit teaching to homeschool my special needs son and the wife of a small business owner, I’m always looking for frugal ways to make my home beautiful. Thank you! maybe later I will do a post all about caring for indoor plants! I am good about watering them but horrible about fertilizing or replenishing the soil. I was homeschooled too! 🙂 and plan to hopefully homeschool my own kids one day too. thanks for reading and commenting! 🙂 welcome! What’s up to every one, it’s actually a fastidious for me to go to see this web page, it consists of priceless Information. nice post, floral arrangements plays key role in home decors, flowers look beautiful and gives beauty to your homes.